Can funk change the weather? If so, what are the implications for the fight against climate change? Discuss. Seriously, though, this isn't school, and that assignment isn't due at the end of the hour. Funk, though, does have a summery sheen in my experience. It's great sweaty dance music but with enough chill that you can listen on a sweltering day, nodding coolly to the beat ... whether it's pure funk, or comes under the guise of Afrobeat, Latin jazz, New Orleans brass, or something else entirely. And apparently varieties of funk have caught my attention recently, because following the recent post on Seattle's Cascadia '10, we swing across the nation for more from the other edge of the USA. 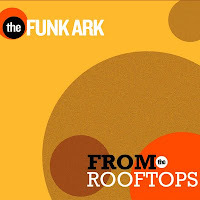 The Funk Ark hails from Washington DC, where there's little chance of a biblical-scale flood, but every need for some summer shelter from the heat and humidity. (I know, I once spent a summer working sweating there.) The eight-piece group is led by keyboardist/producer Will Rast, bubbles out a savory mix of various funky musics, including some rapping by Asheru and Sitali on "Funky DC" and some great instrumental tracks, including the title cut. Fans of Antibalas and Souljazz Orchestra and Ocote Soul Sounds, be sure to check them out. Here's a sample about a funky beast.